If you wear contact lenses like I do and you want to cut down expenses in contact lens solutions then spend only PhP95.00 (US$2.16) and buy Lens Care. This is locally manufactured and it works completely the same as any of the imported brands of contact lens cleaners you get from boutique shops and stores in malls. Put more money in your pockets and head off to Mercury Drug to buy this today. By the way, as for your savings — add it to your savings. You can probably save as little as PhP400 a year by switching to this. 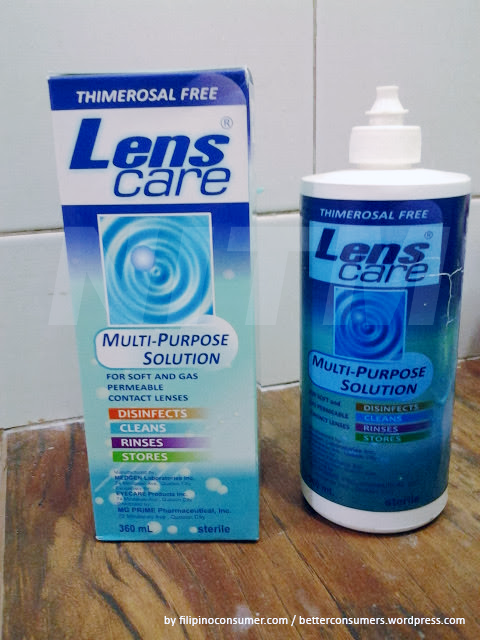 This Lens Care Multi-Purpose Solution is now available with Anti-Microbial Lens Case. And now in NEW 90 mL on Mercury Drugstores.